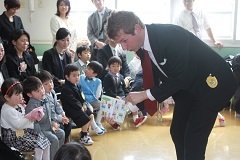 Today was the Opening Ceremony for our new Junior friends here at I.Y.K. 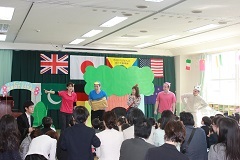 All of the children were fantastic and there were many smiles and lots of English. The children first got their new name badges and met their new teachers for the year. We then all watched a special teacher’s play where we met a penguin, pig, rabbit and mice all starting their first day of Kindergarten too! We are all very excited here to start the school year from tomorrow and cannot wait to see everyone in the morning! Great job everyone.